Spain in December can be a special time. Certainly, you'll not be able to lounge in the sun on the beaches but the winter holidays in Spain can be both intriguing and beautiful. But if you're looking to spend the holiday season in Spain you'll need to know about the weather in order to plan your itinerary and pack for the trip. This a little snapshot of the December climate throughout Spain and well as some enticing reasons for visiting in winter. Some of the Spanish Christmas traditions will seem unusual to a visitor. But for the curious and the traveler interested in culture, some of the weird and wonderful Christmas traditions will be reason enough to visit. There are celebrations and religious services from mid-December through January 6. There is the giant multi-billion euro lottery, splendid nativity scenes (some as large as a whole village), lots of great food, and one of the biggest New Year's Eve celebrations you are likely to see. Spain is one of the warmest countries in Europe, but you won't escape a European winter by heading south. Spain's winters are milder than in much of Europe, but we definitely recommend packing some warm clothes and a jacket or two. A white Christmas is largely impossible in Spain. None of the biggest cities get snow around the holidays. The coldest cities in Spain are Leon, Burgos, and Cuenca, and none have had a white Christmas in recent memory. The only place you could get to see snow on Christmas Day would be up a mountain. If you are a winter sports aficionado, you can certainly find a place to go Skiing in Spain. Spain is one of the warmest countries in Europe, but you won't escape a European winter by heading south. Spain's winters are milder than in much of Europe but pack some warm clothes and a jacket or two. While much of December is devoted to the Christmas holidays there still is a variety of things to do in December in Spain. In the Costa del Sol, there are some unique festivals. The Torrax migas festival is a festival to celebrate a single dish, the peasants' favorite, fried breadcrumbs called migas. And then there is the Malaga Verdiales festival devoted to a type of flamenco. In Seville, you'll find a unique event. You can learn about and see the traditional Dance of the Seises​ at Seville's cathedral during the Inmaculada festival. And, not to be forgotten is a Spanish New Year's Eve. The stroke of midnight is either spent in the main square of a city or at home. Most bars will be closed, opening around 1 a.m. for a night of revelry. Wherever you choose to celebrate, make sure you have twelve grapes to eat at each gong of midnight. While each area of Spain has different weather, overall the weather is considered mild for winter. Weather in December in Madrid can be chilly especially at night where it could be below freezing. The average maximum temperature in Madrid in December is 52 degrees F/ 11 C and the average minimum temperature is 36 degrees F/ 2 C.
There's much to do and see in Madrid whether you opt to visit museums and spend time in cafes or want to be out walking and more active. Weather in December in Barcelona is a bit warmer than in Madrid. The sea has a warming effect in winter, but Barcelona can still get pretty chilly, especially when the sun goes down. Rainy and overcast days are common, though there should be some days where the sun does peek out (but the temperature remains on the colder side). The average maximum temperature in Barcelona in December is 57 degrees F/14 C and the average minimum temperature is 43 degrees F/6 C.
There is also a lot to do in Barcelona. The food is amazing and there are unique areas to wander such as the Gothic Quarter, El Born, the Raval, Barceloneta, and Gracia, as well as seeing the outside of Gaudi’s buildings in the Eixample area (La Pedrera, Casa Batllo, and the Sagrada Familia). It's recommended that you spend the first day on a sightseeing bus tour because although Barcelona is smaller than Madrid, its sights are more spread out, making a tour bus a great way to get an overview of the city. Next, you may want to spend an hour or so inside the Sagrada Familia admiring the progress of Gaudi's work. If you're one of those people that seize up in the cold, Andalusia may have the mildest weather in Spain in December, although it can still get chilly at night (albeit less so in coastal areas). However, it rains on average one-in-three days in Andalusia during this season. The average maximum temperature in Malaga in December is 63 degrees F/17 C and the average minimum temperature is 48 degrees F/9 C.
When visiting the cities of Andalusia, there are two must-sees. The Alhambra in Granada, a Moorish fortress complex with architectural details of immense beauty and gardens like you won't see anywhere else is an important stop. Next, the Cathedral and Alcazar in Seville are the best sights in Seville, and they are side by side. The Cathedral is huge and marries Christian and Moorish design in a spectacular effect. On average it rains on 50 percent of the days in December in Bilbao, so pack an umbrella and rain jacket even at the coast. The average maximum temperature in Bilbao in December is 57 degrees F/14 C and the average minimum temperature is 45 degrees F/ 7 C. Note that it can get quite a bit colder further inland. Spain's Basque Country is a draw at any time of year. Not as touristy as Andalusia, Madrid, or Barcelona, it still has a lot to offer visitors, particularly its wine and cuisine and the Guggenheim museum. The culture is fascinating and very different from other areas of Spain. 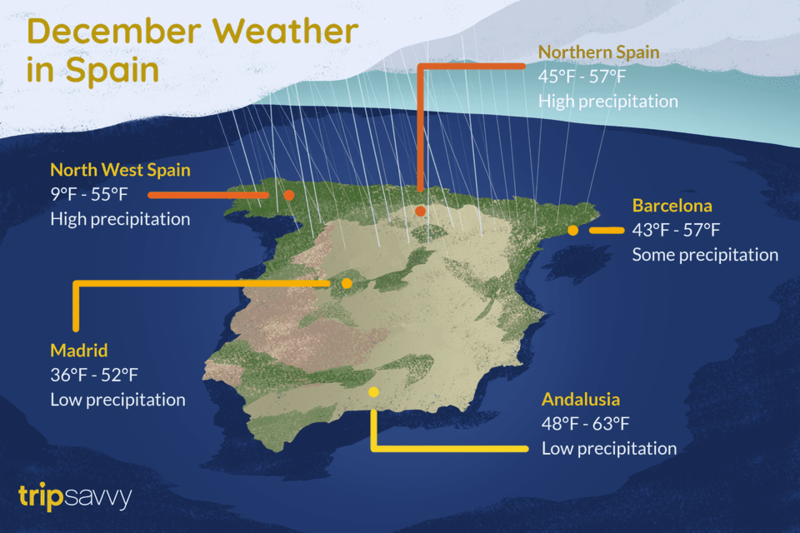 The wettest region in Spain has its wettest month in December (it rains on 21 days out of 30 in December in Santiago). It doesn't get as cold as it does inland (especially at night, when it's as warm as the Costa del Sol). The average maximum temperature in Santiago de Compostela in December is 55 degrees F/13 C and the average minimum temperature is 9 degrees C.
North-West Spain is known as "Green Spain," the regions of Asturias and Galicia (as well as parts of Castilla y Leon) are very different from the rest of Spain as they have rolling green hills. Visit the Cathedral in Santiago de Compostela, the final destination of those on the Camino de Santiago which you will certainly become aware of as you travel in that area.